Web design is important, for both aesthetic and bottom-line reasons. Your website is the digital face of your business, and in many cases it will be more familiar to your customers than the physical location of your business. Whether you use your website to sell products or services directly through eCommerce, or primarily as a marketing tool, your design choices can make a real impact on your business. Trends come and go quickly online, so we recommend using web design practices that stand the test of time. Integrating new ideas is vital, but only if they add real value to your site. Careful, goal-oriented planning is the key to building an effective website that strikes the right balance between usability, visual appeal, and valuable information. What do you want your website to accomplish? How should it look, and who are you trying to attract? Before you get into the nuts and bolts of building your site, it’s important to have clear goals in mind. If you plan to sell products online, you’ll want to design a different experience than you would for a site that’s primarily an informational resource. By developing a clear plan at the start, you’ll save yourself plenty of time and energy in the long run. 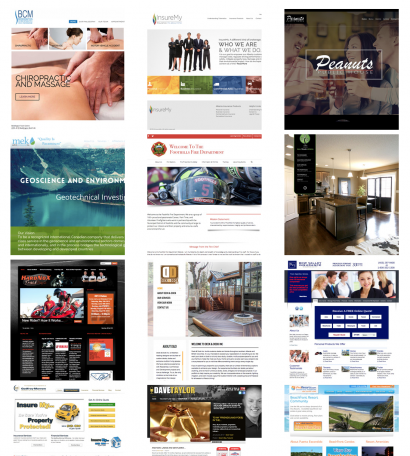 It’s important to note that these concepts don’t apply only to building a new website. You can also use the same general process to overhauling your current site. At the start, your main task will be to set goals for the overall purpose of your site. Your choice will play an important role in determining the look, feel, and function of your site. Choosing one goal doesn’t have to mean excluding others. You can certainly build an eCommerce website that also provides informational value, but having a clear, defined direction is vital to get started. Your goals should also align with your target audience. Consider your target demographic’s age, interests, and tech-savvy as you shape your site. A website geared toward marketing to millenials, for example, might look quite different than a site designed to market the same product to prior generations. The great thing about building a website is that it’s not a static process. While you don’t want to make changes just for the sake of it, you will have the opportunity to improve your site over time. Analytics will help you evaluate your own site, and you can also take lessons from the design successes of other websites. For most businesses, flat design is the way to go. Flat web design offers a clean, attractive look, and a layout that’s easy for site visitors to understand. The look of your site is important, but nothing tops navigation when it comes to the user experience. Your navigation should be clearly labelled, easy to find, and designed in accordance with the purpose of your website. Looking for a reliable way to draw new visitors to your well-designed site? Search engine optimization will make your site more visible, without compromising the quality of your content. Don’t forget about your mobile site! Responsiveness is required to reach the many users browsing the web on mobile devices. Your job doesn’t end when your website goes live. Rely on your analytics to find out which parts of your site work well, and which could use an update. User testing is another powerful way to generate valuable feedback on your site. Constant improvement is the name of the game. At every step of the process, remember that ease of use takes priority. If your site allows users to accomplish their task quickly and painlessly, they’ll be much more likely to come back in the future. Great websites don’t happen by accident. If you are planning a new site or a redesign for your Calgary business, take the time to consider your goals, and research the best ways to reach them. Take note of the latest website design trends, but don’t feel like you have to include a concept just because it’s new and popular. If you build a site that’s easy to use, responsive, and visually appealing, you’ll have no trouble standing the test of time. Looking to get more out of your website and online marketing? Emphasize Design offers website design and comprehensive inbound marketing services to ensure that your Calgary business always outshines the competition.